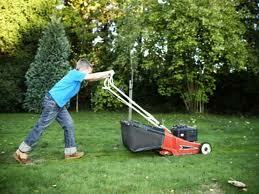 5 components of a jobseeker’s company called Me, Inc.
My son just learned how to cut the lawn…well sort of. I still have to follow him around, helping to guide the mower and making sure he doesn’t run over any objects hidden from his sight. The first time he cut the lawn, he ran over our dog’s wire cable, causing me to wonder if this would be the first and last time he’d cut the lawn. As I’m helping him to better learn the fine art of lawn-mowing, I fantasize about my kid starting his own business, which would ultimately depend on him (or me) creating a company. When I think about my 11-year-old son starting his own lawn mowing business, I relate it to my jobseekers who all have their own business–it’s called Me, Inc., a term Martin Yate applies to jobseekers, who are ultimately responsible for selling a great product, themselves. In an article Martin wrote, he talks about the five components of Me, Inc. as they apply to jobseekers, which makes total sense because jobseekers are a business of one. Here is Martin’s explanation, verbatim, of the five components necessary for jobseekers to run Me, Inc.
Strategic Planning: This encourages you to create concrete plans to achieve the goals you have for your future: plans for growth with your current employer, plans to time strategic career moves that take you to new employers or new professions. Creating actionable strategies for the realities of your professional future enables you to make your plans happen on your timetable and not as a panicked reaction to unforeseen employment disruptions. My son has years to go before he establishes his prosperous lawn-mowing company, but jobseekers must put to use what Martin proposes for a successful company called Me, Inc. Only when they take ownership of their job search will they operate as a successful business that sells a great product. Martin Yate, CPC, author of Knock ’em Dead: Secrets & Strategies for Success in an Uncertain World, is a New York Times and international bestseller of job search and career management books. He is the author of 11 job search and career management books published throughout the English speaking world and in over 50 foreign language editions. Over thirty years in career management, including stints as an international technology headhunter, head of HR for a publicly traded company and Director of Training and Development for an international employment services organization. This entry was posted in Career Search, Résumé Writing and tagged job search, resume on March 12, 2014 by Things Career Related.